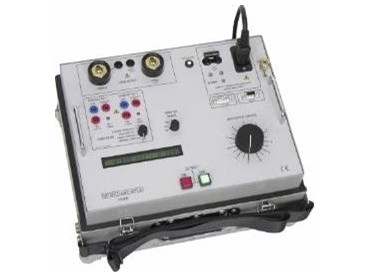 T&R Test Equipment is in the field of current injection equipment. The range includes secondary injection units with 100A output capability up to 6000A primary injection systems. All have true RMS metering, a flexible timing system and an easy to understand user interface. The 750ADM and 750ADM-H, from Macey's Electrical , are compact, rugged primary current injection systems with a 750A output capability. The 750ADM has a maximum no load output voltage of 3.5V and the 750ADM-H has a maximum voltage of 5V. The units are suited to all low power primary injection tasks requiring up to 750A for short periods. Where higher currents and powers are required for primary injection, 7kVA and 20kVA primary injection systems are available. The PCU1/E and PCU2/E systems have separate control and loading units, allowing a wide range of load conditions to be covered with different loading units. The units have two outputs, allowing injection of currents as low as a few hundred milliamps and up to 750A. Voltages up to 16V are available on the 40A output, allowing higher impedance trips to be tested. Four true RMS metering ranges are provided, allowing the full scale of the meter and trip level to be set independently of the selected output. Industry standard connectors are used on all inputs and outputs for convenience, reliability and safety. The 750ADM and 750ADM-H are comprehensively protected by electronic overcurrent and thermal trips. The timing system is very flexible without compromising ease of use, allowing trip times, reset times and reclose times to be quickly measured to a high degree of accuracy. Two contact inputs are provided, each of which may be trigged by a volt-free contact or a dc voltage. The contact inputs auto-sense for normally open or normally closed contacts. The unit can also be used for current transformer ratio testing and as a dual channel stand-alone timing system.